அபிராமி அந்தாதியும் ? காமகோட்டமும் என்ற தலைப்பில் ஒரு சிறு புத்தகம் பிரசுரிக்க ஸ்ரீ பெரியவர்கள் விரும்பினார்கள். அதற்குச் சில தினங்கள் முன் ஒரு நாள் என்னை வரும்படி உத்தரவு வந்தது. நான் தர்சனம் செய்து கொண்டபோது , அவர்கள் ? அபிராமிபட்டர் அநேகமாக முழுக்க, காமாக்ஷியைப் பற்றி, அவருடைய அந்தாதியில் பாடியிருக்கிறார் தெரியுமா ? ?, என்றார் . நான் ? இல்லையே ! அபிராமி பற்றித்தான் பாடியிருக்கிறார் ? என்றேன். பெரும்பாலும் பாடியிருக்கிறார் என்று ஊகித்துப் பார்த்தால் சில பாடல்களிலிருந்து தெரியும் . ?எப்படின்னு தெரியுமா? என்று சொல்லியபின், அபிராமி அந்தாதியிலிருந்து ஒரு பாட்டை சொன்னார்கள் . இந்தப் பாட்டில் சொல்லியிருக்கும் ஆயுதங்கள் எல்லாம் திருக்கடையூர் அபிராமி அம்பாளின் கையில் இல்லை . இந்த ஆயுதங்கள் கூடிய திரிபுர சுந்தரியின் கருஞ்சிலா மூர்த்தி காஞ்சியில் உள்ள காமாக்ஷியைத் தவிர வேறு எங்குமில்லை. ? பிறகு பெரியவர்கள் ? காமாக்ஷி எந்த ஆசனம் போட்டு உட்கார்ந்திருகிறாள்?? என்று கேட்டபோது , நான் ?பத்மாசனம் ? என்றேன். Kanchi Achraya on the Qualities needed to be a true teacher . September 5th is celebrated as a Teachers Day in India and this message is apt for those who want to play the role of teachers in whichever subject they want to be . Every family must perform puja to Isvara. Those who find it convenient to do so may conduct elaborate types of puja after receiving proper initiation into them. Others need perform only a brief puja, not lasting more than ten minutes or so. Office goers must offer at least this brief worship. The sacred bell must ring in every home. Images must be installed to worship Siva, Amba, Visnu, Vinayaka, and Surya. This is called "pancayatana puja". According to one custom, no graven images [images with limbs] are used but instead natural objects to represent the five deities. The "bana-linga" for Siva is obtained from the Omkara -kunda of the Narmada River. The svarnamukhi stone for Ambika (it has a golden streak on it) is to be taken from the bed of the Svarnamukhi river in Andhra Prades. The symbol of Vishnu, salagrama, is obtained from the Gandaki River in Nepal. The crystal stone for surya is got from Vallam, near Tanjavur. The sonabhadra stone for Vinayaka is obtained from the Sone River, a tributary of the Ganga. These five stones are symbolic of the unity of India. None of these five stones has eyes, nose, ears, etc. Since they have no corners that become untidy, they are easy to bathe and dry. Being small they do not occupy much space. No big puja hall or room is necessary. A small casket is enough. Pancayatana puja was revived by Sankara Bhagavatpada. As the creator of the Sanmata system (the worship of six deities)he added Subrahmanya to the five. So with the five stones we may add a small spear to represent Velayadah (Subrahmanya) who bears the spear. Not much effort is needed for the puja. If you have the will, it could be performed wherever you happen to be. At home when you do the puja you have to present to the deities cooked rice called "maha-naivedya". The Lord has created the entire cosmos for our sake. Our sense organs take delight in the various objects in creation. All that gives us joy, all that is beneficial in creation, must be offered to the Lord [symbolically] before being partaken of by us. When we offer any food as naivedya to Him, do we really give it away to Him? We just place it before Him and then partake of it ourselves. Some ask, scornfully, whether the Lord himself eats what is offered to Him. "Nivedana"does not mean making the Lord really "eat" what is offered. He does not have to eat. Puja is meant to make us inwardly pure and the Lord does not have anything to gain from it. "Nivedayami" means I am making it know to you (informing you)" and does not mean "I am feeding you". You must speak thus to Isvara:"O Lord, in your compassion you have given us this food." Then you must eat the food thus offered, thinking of Him. Without His grace how does the rice grow? Experts may conduct research and write big tomes on rice. But are they capable of making one grain of rice? What is called synthetic rice is made out of materials already created by Isvara. So all that seems to be made of man must be finally traced to God's creation. To enjoy what he has given us without first presenting it to Him would be tantamount to thieving. He who is present everywhere must be present where we want Him to be present so that He may be grasped by us. Whatever the material out of which His image of symbol is made-stone, earth, copper- he will come to us in that material and in that image or symbol. He will do so out of His compassion and He has the power to do so. We would have no need for him otherwise. The Lord must be worshipped in every home. He must be invoked and it must be made known to Him that we are using nothing but what he has made over as a gift to us. If we keep doing so, we will in due course have the wisdom not to use in puja things not fit to be offered to Him. We ourselves will come to possess good qualities. What is the obstacle to one-pointed meditation? The answer is the unstill mind. All problems are caused by the mind, by the desires arising in it. It is not easy to control the mind and keep it away effectively from desire. If we ask the mind to think of an object, it seems to obey us for a moment, but soon it takes its own course, wandering off. When I speak to you about meditation and tranquillity, for a moment your mind will perhaps become still and you will be happy. But in a trice it will go astray and the calm you experienced for a few seconds will give place to unquietness. If you bid your mouth to keep shut, it obeys you for a brief moment. Similarly, if you close your eyes asking them not to see anything, they shut themselves off from the outside world for some moments. But try as you might to tell your mind not to think of anything, it will not listen to you. minds. In fact none of us have any control over the mind. A madman keeps blabbering. But what about us? We let the mind go freely to keep blabbering inwardly. Do you know what it means to have mental control? Suppose you are suffering from a severe pain. If you ask your mind not to feel the pain, it shall not feel it in obedience to you [that is you will not feel the pain]. Even if a tiger comes face to face with you and growls you will feel no fear if you ask your mind not to be afraid of the beast. Now we keep crying for no reason. If the mind is under control we will keep smiling even if there is cause for much sorrow. And under the gravest of provocations it will not be roused to anger and will remain calm. First we must train our mind not to keep wandering. One way of doing it is to apply it to good activities. When oil falls in a steady flow, without spraying, it is called "tailadhara". The mind must be gathered together and made steady. It must be accustomed to think of noble and exalted objects like the Lord. Eventually, the very act of "thinking" will cease and we will dissolve in Isvara to become Isvara. Yoga is controlling the mind in this manner. experiences bliss, so says Sri Krsna You must not turn away from yoga thinking that it is meant only for people like the sages. Who needs medicine? The sick. We suffer from manovyadhi, mental sickness. So we must take the medicine that cures it. inward means, the mind must first be applied to good things one pointedly and eventually lead to a state in which it does not think of anything at all. The outward means consists, for example, of sandhyavandana, sacrifices, charity and so on. The best inward means is meditation. There are five inward (antaranga) means to aid meditation. They are ahimsa (nonviolence), satya (truthfulness), asteyam (non-stealing), sauca (cleanliness) and indriya-nigraha [subduing the senses, if not obliterating them]. To practise ahimsa is to imbue the mind with love for all and not even think of harming others. Asteyam means not coveting other people's goods. For satya, or truthfulness, to be complete one's entire being, including body, mind and speech, must be involved in its practice. Sauca is hygiene, observing cleanliness by bathing, maintaining ritual purity, etc. Indriyanigraha implies limits placed on sensual enjoyment. "The eyes must not see certain things, the ears must not hear certain things and the mouth must not eat certain things"-restrictions with regard to what you can see, listen to, eat and do with your body. The body is meant for sadhana, for Atmic discipline. The senses must be "fed" only to the extent necessary to keep the body alive. 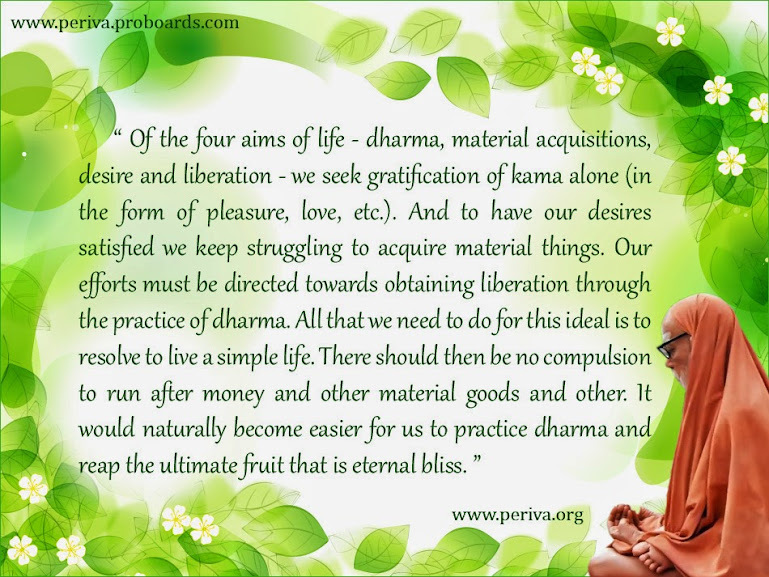 These five dharmas are to be practiced by all Hindus without any distinction of caste or community. I have stated again and again that the people must perform the rites handed down to them from forefathers, that they must adhere to the practices pertaining to the tradition to which they belong and they must wear the symbols appropriates to the same, like the holy ashes or Tiruman, the rudraksa, etc. Some people hold the view that all that is needed is conduct and character, that conduct is a matter of the mind, that religious customs are but part of the external life. In truth, however, your outward actions and the symbols worn by you outwardly have an impact on the inner life. There is a relationship between bodily work and inner feelings. Let me illustrates this truth. One day, unexpectedly, a man comes to know he was won prize in a lottery, say, one lakh rupees. His joy knows no bounds, but it makes its own impact on his body. He becomes so excited that his breathing itself stops for a moment and he faints. "A particular feeling creates a specific change in the process of breathing". From this practical observation yoga develops lessons in breathing to create healthy and noble feeling and urges. Often the outward appearance reflects the inner feelings. When you are angry your eyes become red, your lips quiver. When you are sorrowful your eyes become moist and you shed tears. If you are happy you are agape, showing all your teeth. Thus there is a definite connection between the body and the mind, between the body and the inner feelings. Based on this fact, the wise have devised yogic postures that are calculated to nurture particular Atmic qualities. Will soldiers be less valorous if they do not wear their uniforms? All over the world members of the defense services wear uniforms and it is claimed that they keep them fighting fit and inspire courage in them. The symbols worn outside, the samskaras performed outwardly, are inwardly beneficial. If you think that it is all a disguise so it will be. You must resolve to wear the symbols in all sincerity and perform the rites too. Then they will truly cause purity within. Outward action helps you inwardly. It perhaps natural that I should give importance to samskaras, to the custom of wearing symbols like the sacred ashes, rudraksa, etc. After all, I am the head of Matha and you will come to me only if I wear all these. You will give me money for the conduct of the Matha. So all these symbols that I wear serve a purpose in my case. But your case is different. You have your own means of livelihood and you may be able to perform samsakaras even more sincerely than I do and make yourself pure by wearing the symbols of our religion. Let us wear the signs that remind us of the Supreme Truth. Let us perform the rites that keep us away from evil. Let us be of good conduct and character and cleans our consciousness. And let us meditate on the Ultimate Reality, experience It inwardly, realize bliss. Jaya Jaya Shankara, Hara Hara Shankara! Periyava had always chosen simple, unassuming people to do bigger tasks. There are so many in the list. I consider it as a honor to write about Shri Ravi (a.k.a ?Athirudram? Ravi). A school teacher in Srirangam, a bachelor, comes from a middle-class brahmin family like all of us, has been picked by periyava to do great things. His father retired from BHEL Trichy sometime back and settled in Srirangam. I had a great opportunity to meet Ravi and eat at his place too when I was in India last time! It seems that several years back when Ravi was at a Dakshinamurthy temple, he saw a vision of Mahaperiyava in the sanctum. Ever since, he has been carrying out some of the impossible tasks for several years. With the blessings of Periyava, Ravi has been conducting Athirudrams in several of divya kshetrams of Mahaperiyava (in several adishtanams etc) for Jayanthi/Aradhana. So far he has completed 16 athirudrams and 11 jataparayanams!!!. Each run into several lakhs and myriad of complexities in organizing a vedic function like this. With Periyava?s grace, he was able to do this with ease. All these events are blessed by HH Pudhu Periyava and Bala Periyava. As we all know, Pudhu Periyava, despite his health, traveled to almost all of the athirudrams/jataparayanam that Ravi had conducted and blessed the event. This time he is doing a jataparayanam in Sri Avudayar kovil. Mahaperiyava had talked in length about the greatness of this kshetram. Read the article below to know more details. Since last two major events, Ravi has been struggling to get enough sponsors. While he leaves it to Periyava to manage, it is our responsibility to shoulder Ravi in whatever way possible in such a noble task. Ravi made a request to see if we can some how support at least the ritwik sambhavanai (Rs 17,000/ritwik) ? we have a total of nearly 35 ritwiks. I sincerely request all of our readers to support Ravi AND attend this great event. Shri Ravi can be contacted at 9443733573 / shankarakaingaryam@yahoo.com. I pray our Periyava and Yogambaal sametha Athmanathaswamy to successfully conduct this event. AT THIRUPERUNDARAI (AVUDAIYAR KOVIL) PUDUKOTTAI DSICTRICT, TAMILNADU. SREE CHANDRA SEKARENDRA SARASWATHY SWAMIGAL KAINGARYA TRUST takes pleasure in announcing to all devotees, and aasthika friends about the series of JataaParayanam (ஜடை பாராயணம்) being organized and performed at select temples of South India. The above Sanskrit verse highlights the importance and significance of Jataaparayanam in particular. JatayantuSahasrakam? ? (जटायान्थुसहस्रकम्) goes to extol that JataParayanam, whenever performed, is equivalent to Thousand Vedic sacred acts performed together. To help our community reap the innumerable benefits such a sacred act brings about, performance of ?Jataaparayanam? at select ancient temples of South India, is being organized. The chosen temples are both unique in their own historic significance and also share many common features amongst them; apart from being built on sprawling campuses, replete with four majestic tall raja Gopurams, it is also believed that these temples of yore have not had a regular consecration ceremony for a very long time owing to some reason or the other. It is for such reasons that performance of JataParayanam has been prescribed at such of these temples by the divine will of the Paramaachaarya. RIG SAMHITHA HOMAM, RIGVEDA, KRISHNAYAJURVEDA JATAA PARAYANAM, AND SAMAVEDA PARAYANAM, and also RAMAYANA, BHAVATHA, SHANKARABHASHYA PARAYANAM etc FROM 8TH DEC?2014 TO 18TH DEC?2014. at the famous Shiva sthalam Thiruperunthurai (திருப்பெருந்துறை) -more popularly known as Avudayarkoil, located 14 km southeast of Aranthangi, in Pudukkottai district, Tamilnadu. It is in this humble town that Saint Manickkavasakar was lived some 1200 years ago. In fact, though the presiding deities of the temple are known and worshiped as Lord Athmanathaswamy and Goddess Yogambaal, there are no idols for the deities; this depicts and emphasizes the formlessness (Aruvam ? அருவம் ) of the cosmic supremacy; nor there is Nandi or Navagrahams in this temple unlike most Shiva temples. The Utsavamurthy idol also that of Saint Manickkavasakar?s only, which receives all standard temple protocol respects as well as taken around the temple in ceremonial procession. It may also be interesting to note that Sri Sri Sri MahaPeriyava has stayed in this kshetram, observing his Chathurmasyavratham? performing Chandramouleeswararpoojai under the same kurundai tree in the year 1934 under which Saint Manickkavasakar sang his famous Siva Puranam, forming the first part of Thiruvaasakam. On 12thDec-2014, on the occasion of Karthigai Magham ? birthstar of Saint Manickkavasakar- chanting of the entire Thiruvasagam, popularly referred to as ?Thiruvaasagam Mutrothal? (திருவாசகமுற்றோதுதல்) is planned. On this day as well as on 18.12.2014, the day of Sri Sri Sri Mahaperiyava Aradhanai, there will be public Samaaradhanai bhojanam for all participating devotees. The proposed JataaParayanam is being organized over eleven days, when nearly 35 rithwiks will perform and participate in the chanting and homam. Approximate expenses for the above Jataparayanam is estimated around Rs. 10 Lakhs. This would cover major expenses of dravyam for japa, parayana, homam, rithwik sambhavanai and bhojanam. Ritwik sabhavanai itself is estimated around 5.9 lakhs (Rs 17,000 / ritwik). All are requested to benefit from the above divine endeavor by personally participating in these events; all are also requested to support the cause by liberally donating, contributing in cash and/or kind. The above fete is conducted essentially using voluntary donations and contributions of individual aasthikaas and not on any institutional sponsorship. The donations to the above trust are eligible for tax rebate u/s 80 G of Income Tax act. PAN number of the trust (needed for claiming tax rebate benefit) is ? AAGTS4379A. மார்கழி மாதம் பிறந்து விட்டால் போதும் ? தமிழ்நாட்டிலுள்ள எல்லாக் கோவில்களின் கோபுரங்களிலிருந்தும் இசைமாரி பொழிய ஆரம்பித்து விடும் ? விடியற்காலை நாலு மணியிலிருந்தே ! சிவன் கோவிலாக இருந்தால், திருவெம்பாவையும் திருபள்ளிஎழுச்சியும்; பெருமாள் கோவிலாக இருந்தால், திருப்பாவை. இது தவிர, திருப்பாவை ? திருவெம்பாவை மாநாடுகள்; வைணப் புலவர்கள் காலில் சக்கரத்தைக் கட்டிக்கொண்டு, ஊர் ஊராகச் சென்று சொற்பொழியாற்றுவார்கள். பள்ளிக்கூடங்களில், பாவப் பாடல் போட்டி ? பரிசுகள் ! இத்தனைக் கோலாகலம் எப்போது, யாரால் ஆரம்பிக்கப்பட்டது ? தலைக்காவேரியில்,நீர்த்திவலைகலாகக் தோன்றும் காவேரி, பறந்து விரிந்து வெள்ளமாகப் பெருகி அகண்டகாவேரியாக மாறிப் பிரமிக்க வைக்கிறது. அப்படித்தான், பாவைகள் பப்ளிக் ஆனதும், யாரோ சில சைவர்களும் வைணவர்களும் தனித்தனியாக முணுமுணுத்துக் கொண்டிருந்த பாவைகள், பார் எங்கும் பரவி, விசுவரூபம் எடுத்துவிட்டன. 1949, மகாசுவாமிகள் திருவிடமருதூரில் தங்கியிருந்தார்கள். மகாலிங்கஸ்வாமி கோவிலில், செட்டியார் வகுப்பைச் சேர்ந்த ஓர் அம்மையார் கையில் ஒரு புத்தகத்தை வைத்துக் கொண்டு நாள்தோறும் பாடி வருவதைப் பெரியவா கவனித்துவிட்டர்கள். ? அந்த ஆச்சி என்ன பாடிக்கொண்டிருக்கா தெரியுமோ ?? உடன் வந்துக்கொண்டிருந்த பக்தர் ராமமூர்த்தியையும் கைங்கர்யபரர் கண்ணனையும் பார்த்துக் கேட்டார்கள். பெரியவா. ஒரே குரலில், ?தெரியாது? என்று பதில் வந்தது. ?அந்த ஆச்சி அம்மாள், திருவெம்பாவை படிச்சிண்டிருக்கா ? நல்ல ராகத்தோட..? இரண்டு நிமிஷ நடை. ?இந்தப் பாடல்களை எல்லோரும் பாட வேண்டும் என்று பிரசாரம் செய்தால், யாரவது பாடுவார்களா ?.. ?ஒருவரும் பாட மாட்டார்கள். இது, யாருக்குத் தெரியும் ?..? பெரியவாள் சிந்தனையில் ஆழ்ந்தார்கள். அவர்கள் மனத்திரையில் மணிவாசகரும் ஆண்டாளும் காட்சி தந்தார்கள் போலும் ! அற்புதமான பாடல்கள், அறைக்குள்ளேயே கிடக்கின்றன, அரங்கத்துக்கு வந்தால் லோகோபகாரமாக இருக்குமே ?.. ?ராமமூர்த்தி.. திருப்பாவை ? திருவெம்பாவை மகாநாடு நடத்தணும்; ஏற்பாடு செய் ..? அவ்வாறே ஏற்பாடு செய்யப்பட்டது. தமிழ்நாட்டின் முன்னணிப் பாடகர்கள், சொற்பொழிவாளர்கள் கலந்துகொண்டார்கள், ஏகப்பட்ட விளம்பரம் ! திருவெம்பாவை ? திருப்பள்ளிஎழுச்சி ? திருப்பாவை புத்தகங்கள் ஆயிரக்கணக்கில் அச்சிடப்பட்டு இலவசமாக விநியோகிக்கப்பட்டன. பாவைப் பாடல்களின் பண் நயமும் இலக்கிய நயமும் அறிஞர்களால் விளக்கி மொழியப்பட்டன. அவற்றின் பக்தி ரசத்தைச் சுவைத்து மயங்காதவரே இல்லை. பாவைப் பாடல் இசைத்தட்டுக்கள் அமோகமாக விற்பனை ஆயின. மார்கழி மாதம் வந்தது. பெரியவா, வெறும் உபதேசியார் அல்லர். உபதேசங்களை நத்திக் காட்டுபவர்கள். ?மார்கழி விடியற்காலையில் பாவைப் பாடல்களைப் பாட வேண்டும் ? என்று சொல்லிவிட்டால் மட்டும் போதுமா ? ?பிரகலாதன்? என்று ஒரு யானை ஸ்ரீமடத்தில் இருந்தது. ராமமூர்த்தியையும் கண்ணனையும் அதன் மேல் உட்கார்ந்துகொண்டு, கையில் அரிக்கேன் விளக்கு வெளிச்சத்தில், புத்தகத்தைப் பார்த்துப் பாவைப் பாடல்களைப் பாடிக்கொண்டு, திருவிடைமருதூர் மகாலிங்கசுவாமி கோவிலின் நான்கு வீதிகளிலும் பவனி வரச் செய்தார்கள். தமிழ்நாட்டின் மூலை முடுக்குகளிலெல்லாம் பாவை வெள்ளம் பாய்ந்தது; பக்திப் பயிர் வளர்ந்தது; நாயன்மார் ? ஆழ்வார் பக்கம் மக்கள் பார்வை திரும்பியது. தமிழ் பக்தி இலக்கியத்துக்கு அடித்தது யோகம் ! ஓரிரு ஆண்டுகள் சென்றன. ராமமூர்த்தியையும் கண்ணனையும் அழைத்தார்கள், பெரியவாள். ?ஞாபகம் இருக்கா ? ? திருவெம்பாவை யாருக்குத் தெரியும் ? அதை யாரும் பாடமாட்டா ? ன்னு சொன்னேளே ? ? இப்போ யாரவது பாடராளா இது, பெரியவாள் கொடுத்த குட்டு இல்லை; அன்புடன் வழங்கிய ஷொட்டு ! திருப்பாவை ? திருவெம்பாவை (மகா பெரியவா) (sharing message) மார்கழி மாதம் பிறந்து விட்டால் போதும் ? தமிழ்நாட்டிலுள்ள எல்லாக் கோவில்களின் கோபுரங்களிலிருந்தும் இசைமாரி பொழிய ஆரம்பித்து விடும் ? விடியற்காலை நாலு மணியிலிருந்தே ! சிவன் கோவிலாக இருந்தால், திருவெம்பாவையும் திருபள்ளிஎழுச்சியும்; பெருமாள் கோவிலாக இருந்தால், திருப்பாவை. இது தவிர, திருப்பாவை ? திருவெம்பாவை மாநாடுகள்; வைணப் புலவர்கள் காலில் சக்கரத்தைக் கட்டிக்கொண்டு, ஊர் ஊராகச் சென்று சொற்பொழியாற்றுவார்கள். பள்ளிக்கூடங்களில், பாவப் பாடல் போட்டி ? பரிசுகள் ! இத்தனைக் கோலாகலம் எப்போது, யாரால் ஆரம்பிக்கப்பட்டது ? தலைக்காவேரியில்,நீர்த்திவலைகலாகக் தோன்றும் காவேரி, பறந்து விரிந்து வெள்ளமாகப் பெருகி அகண்டகாவேரியாக மாறிப் பிரமிக்க வைக்கிறது. அப்படித்தான், பாவைகள் பப்ளிக் ஆனதும், யாரோ சில சைவர்களும் வைணவர்களும் தனித்தனியாக முணுமுணுத்துக் கொண்டிருந்த பாவைகள், பார் எங்கும் பரவி, விசுவரூபம் எடுத்துவிட்டன. 1949, மகாசுவாமிகள் திருவிடமருதூரில் தங்கியிருந்தார்கள். மகாலிங்கஸ்வாமி கோவிலில், செட்டியார் வகுப்பைச் சேர்ந்த ஓர் அம்மையார் கையில் ஒரு புத்தகத்தை வைத்துக் கொண்டு நாள்தோறும் பாடி வருவதைப் பெரியவா கவனித்துவிட்டர்கள். ? அந்த ஆச்சி என்ன பாடிக்கொண்டிருக்கா தெரியுமோ ?? உடன் வந்துக்கொண்டிருந்த பக்தர் ராமமூர்த்தியையும் கைங்கர்யபரர் கண்ணனையும் பார்த்துக் கேட்டார்கள். பெரியவா. ஒரே குரலில், ?தெரியாது? என்று பதில் வந்தது. ?அந்த ஆச்சி அம்மாள், திருவெம்பாவை படிச்சிண்டிருக்கா ? நல்ல ராகத்தோட..? இரண்டு நிமிஷ நடை. ?இந்தப் பாடல்களை எல்லோரும் பாட வேண்டும் என்று பிரசாரம் செய்தால், யாரவது பாடுவார்களா ?.. ?ஒருவரும் பாட மாட்டார்கள். இது, யாருக்குத் தெரியும் ?..? பெரியவாள் சிந்தனையில் ஆழ்ந்தார்கள். அவர்கள் மனத்திரையில் மணிவாசகரும் ஆண்டாளும் காட்சி தந்தார்கள் போலும் ! அற்புதமான பாடல்கள், அறைக்குள்ளேயே கிடக்கின்றன, அரங்கத்துக்கு வந்தால் லோகோபகாரமாக இருக்குமே ?.. ?ராமமூர்த்தி.. திருப்பாவை ? திருவெம்பாவை மகாநாடு நடத்தணும்; ஏற்பாடு செய் ..? அவ்வாறே ஏற்பாடு செய்யப்பட்டது. தமிழ்நாட்டின் முன்னணிப் பாடகர்கள், சொற்பொழிவாளர்கள் கலந்துகொண்டார்கள், ஏகப்பட்ட விளம்பரம் ! திருவெம்பாவை ? திருப்பள்ளிஎழுச்சி ? திருப்பாவை புத்தகங்கள் ஆயிரக்கணக்கில் அச்சிடப்பட்டு இலவசமாக விநியோகிக்கப்பட்டன. பாவைப் பாடல்களின் பண் நயமும் இலக்கிய நயமும் அறிஞர்களால் விளக்கி மொழியப்பட்டன. அவற்றின் பக்தி ரசத்தைச் சுவைத்து மயங்காதவரே இல்லை. பாவைப் பாடல் இசைத்தட்டுக்கள் அமோகமாக விற்பனை ஆயின. மார்கழி மாதம் வந்தது. பெரியவா, வெறும் உபதேசியார் அல்லர். உபதேசங்களை நத்திக் காட்டுபவர்கள். ?மார்கழி விடியற்காலையில் பாவைப் பாடல்களைப் பாட வேண்டும் ? என்று சொல்லிவிட்டால் மட்டும் போதுமா ? ?பிரகலாதன்? என்று ஒரு யானை ஸ்ரீமடத்தில் இருந்தது. ராமமூர்த்தியையும் கண்ணனையும் அதன் மேல் உட்கார்ந்துகொண்டு, கையில் அரிக்கேன் விளக்கு வெளிச்சத்தில், புத்தகத்தைப் பார்த்துப் பாவைப் பாடல்களைப் பாடிக்கொண்டு, திருவிடைமருதூர் மகாலிங்கசுவாமி கோவிலின் நான்கு வீதிகளிலும் பவனி வரச் செய்தார்கள். அப்புறம் கேட்பானேன் ! தமிழ்நாட்டின் மூலை முடுக்குகளிலெல்லாம் பாவை வெள்ளம் பாய்ந்தது; பக்திப் பயிர் வளர்ந்தது; நாயன்மார் ? ஆழ்வார் பக்கம் மக்கள் பார்வை திரும்பியது. தமிழ் பக்தி இலக்கியத்துக்கு அடித்தது யோகம் ! ஓரிரு ஆண்டுகள் சென்றன. ராமமூர்த்தியையும் கண்ணனையும் அழைத்தார்கள், பெரியவாள். ?ஞாபகம் இருக்கா ? ? திருவெம்பாவை யாருக்குத் தெரியும் ? அதை யாரும் பாடமாட்டா ? ன்னு சொன்னேளே ? ? இப்போ யாரவது பாடராளா இது, பெரியவாள் கொடுத்த குட்டு இல்லை; அன்புடன் வழங்கிய ஷொட்டு !